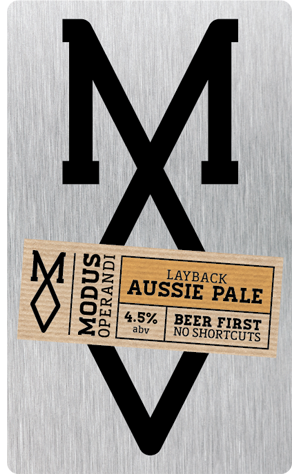 Summer ales have become quite de rigueur in recent years but Modus Operandi weren't just being dedicated followers of fashion when they launched their brewery with one on the menu. Originally released under the name Lola, it was a homage to The Kinks’ eponymous character and something that comes across all sweet and pretty but you find out it’s a little more, ahem, ‘robust’ than first expected – perhaps not even a summer ale at all. With a big blend of American hops, Lola was noticeably bursting with tropical hop flavours and aromas along with those of fresh mangoes. But being very refreshing and easy-drinking, it kept the locals – many of whom were unfamiliar with big flavours of, say, the brewery's flagship IPAs – very happy. In recognition of this, when Modus rebranded at the end of 2015 they decided to ditch the name Lola and went for something more local customers could get behind. Thus Lola became Layback, a name equally appropriate for the surf manoeuvre you might pull in the waves near the brewery or for the position you might take while drinking one of these on the beach.